The cast of Source Code ​​​​​​​ is terrific and the plot movies along nicely keeping the audience focused and engaged. As movies go you could do far worse and I suspect this is one film that changes with each viewing as I’m sure there are more details you notice each time. Imagine you have the power to stop a terrorist attack before it ever happened. You are an Army pilot in a simulator and every eight minutes you end up looping back onto a commuter train outside Chicago that blew up earlier in the morning. Your job is to find the bomb and the bomber to stop an even larger bomb from exploding in the City limits with the potential to kill over 2 million people. It all seems rather sci-fi, doesn't it? Well, that is exactly what it is in the form of a movie called Source Code. The 2011 action/thriller is the latest film to get the 4K treatment and is available for purchase. Soldier Colter Stevens (Jake Gyllenhaal; Brokeback Mountain) is a decorated hero serving his country. Suddenly he wakes to find himself on a train heading to Chicago. He is disoriented and confused and after eight minutes the train explodes. He awakens again to find himself in a simulator having a conversation with another soldier, Colleen Goodwin (Vera Farmiga; Bates Motel) who explains the theory behind source code. Stevens, it seems is simply a tool for the military to try to find out what happened on the train that blew up and stops the bomber. As Stevens goes back into the simulation time and time again, he finds out more disturbing details about the explosion and himself. Eventually, he finds the bomb; then the bomber and averts another terrorist attack. Meanwhile, he grows increasingly interested in another commuter by the name of Christina Warren (Michelle Monaghan; Kiss Kiss Bang Bang). Unfortunately, he also discovers the truth - he died 2 months ago in the Middle East and the powers that be are simply using his brain as a guinea pig - albeit a successful one. Gyllenhaal is masterful as he starts the film confused but shows increasing strength and confidence, especially once he discovers his true fate. Monaghan is a nice balance to him as she is more grounded and centered for much of the film. Farmiga is excellent as well as she navigates her orders and her conscience. The rest of the cast is mostly filler but Jeffrey Wright (Casino Royale) is always interesting as he plays the scientist who invented source code. The upscaled 4KBlu-ray is presented in 2160p quality and Dolby Vision + HDR10 which truly makes for a magnificent sight especially the fire eruption as the train explodes. The background outside the moving train sometimes seems slightly off but is insignificant in the grand scheme of things. The English Dolby Atmos (English 7.1 Dolby TrueHD) is spot on in this instance. The train explosion rocks the viewer to their core yet the dialogue is not overshadowed or diminished in anyway. The Combo pack comes with only two extras besides the Digital Download. The audio commentary is rather interesting if you like that sort of thing and the 5 crazy details you might have missed is cute. Since I did not see Source Code in theaters my first impression was a cross between The Commuter and Edge of Tomorrow, with the film being better than the first but perhaps a little less than the second. The idea and concept are somewhat unique (considering the movie came out prior to the aforementioned Commuter and Edge) however, the science/science fiction was a little too over the top to be conceivable. The cast of Source Code is terrific and the plot movies along nicely keeping the audience focused and engaged. As movies go you could do far worse and I suspect this is one film that changes with each viewing as I'm sure there are more details you notice each time. If you're a fan, pick it up in stores. Download Source Code from the iTunes Store in Digial HD. 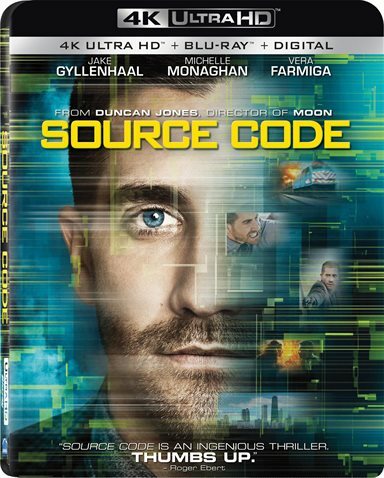 For more information about Source Code visit the FlickDirect Movie Database.